The world is in shadow. To one side stretches the forest, to the other the city. Your claws are stained with blood. Your senses whisper of prey that runs before you, and of predators who stalk even the likes of you. You hear the howls of your brothers and sisters. Luna rises. Your blood boils. It is time to hunt. 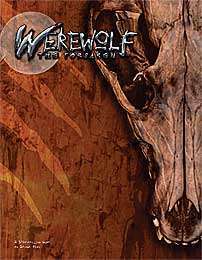 Werewolf: The Forsaken the game of bestial violence and supernatural terror is the second core setting sourcebook intended for use with White Wolf's new Storytelling System™. Werewolves are creatures of original sin, tainted by ancestral crimes and driven to hunt by the shame of being abandoned. This book details what it is to be Forsaken, one of the Tribes of the Moon. Create your own werewolf pack and seek redemption or give in to your savage nature. Is this ever giong to be on print on demand?? I noticed that the pdf was just updated, I hope that's a good sign that the pod option is coming soon. Why is Werwolf The Forsaken unavailable as Print Version? It takes time to convert the files to PoD version for printing. This product appears to be a lower priority than some others. They are definitely converting some, the Invictus book was completed recently. I paid a fortune for my print version on ebay but there are print versions sitting around in stores still. This title was added to our catalog on March 14, 2005.